Greetings from Denver, Colorado, the Mile High City! As I write this, we have a winter wonderland going on outside, with 4 inches of snow on the ground and more coming down at a fast pace. Here’s hoping this finds everyone enjoying the new year so far and having some exciting musical adventures! 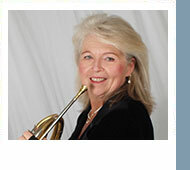 Speaking of exhilarating experiences, I consider myself an adventuresome person, and one of the best and most rewarding things I’ve ever done was to host the 40th International Horn Symposium at Denver University in July of 2008. I know, firsthand, how much work goes into planning such an event, and Gene Berger has put together a truly unforgettable treat for all of us in Muncie, Indiana this summer. This 50th International Horn Symposium will be held July 30-August 4, 2018 at Ball State University. My experience with the International Horn Society began in 1972, when I attended my first IHS Symposium at Indiana University in Bloomington, Indiana. The horn artists, lectures, master classes and the “horn world” inspired me beyond words. My first IHS symposium was the biggest motivation for me to become a music performance major, and then to continue my studies to become a professional musician. Having attended many symposia since then, I can’t say enough about how powerful and inspirational it is to attend and be immersed in our amazing horn community. In this issue, you will find an interview with IHS50 host, Gene Berger, a very enthusiastic reminiscence by David Amram, words from Frøydis on the horn and aging, and Adam Wolf’s “Podcasting at the Symposium.” Also look for Scholarship Program information by Heidi Vogel and Andrew Pelletier, an article about the IHS50 special panel sessions by Jeff Snedeker, a pedagogy column from Christoph Eß of the University of Lübeck…..and more! I wish you a wonderful spring, full of many thrilling musical adventures, and I hope to see everyone in Muncie this summer! What are three good reasons for horn players to come to IHS 50 this summer? Gene Berger: The theme is "The Golden History of the Horn.” My idea was to revisit the traditions of being a horn player and our beautiful history of literature and performers throughout history. Being the 50th anniversary I had to use the word “Golden.” We will be reminding everyone of the last 50 years of the Horn Society and monumental personalities and events. We will have a daily lecture series revisiting events of our past. Special thanks to President Jeffrey Snedeker for working on the details of this lecture series. We will have many participant ensembles to perform in during the symposium. I want everyone of all levels to play and to meet new and old friends during our week. KMT: What about being a host has surprised you the most so far? GB: The surprises of modern times. There have been issues that emerge from a legal standpoint. The university systems are very reactive to issues with minors, money transactions, employment issues with contracts of guests on campus. There are many details that continually change inside the business system in a university. Policies can change, and someone may not know until a form is submitted. Most of the time, it is a proactive policy change due to legal issues and institutions trying to protect and understand laws or rule changes at the state and national level. KMT: Can you tell us a bit about the Featured Artists who will be inspiring us during the symposium? 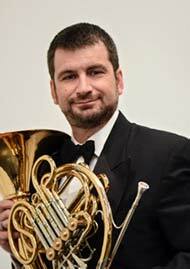 GB: We have the winner of the International Horn Competition of America, Joshua Williams as a featured artist. He will have a solo recital and will also premiere a concerto with the US Army Field Army Band by Amir Zaheri. Frank Lloyd will also premiere a composition by Howard Buss with the band the last night of the conference. 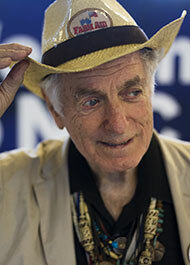 David Amram will perform with Eldon Matlick’s jazz ensemble and will host a performing lecture for all called “ Jazz Fundamentals, Blues in F.” I have invited guest lecturers Frøydis Ree Wekre, Gregory Hustis, and Carolyn Wahl who will present master classes and lectures pertaining to all membership of the IHS. I have invited several new faces to the featured artist list including Robert Danforth from the Indianapolis Symphony, Kevin Rivard from the San Francisco Opera, Jonathan Hammill from the Tokyo Symphony, and Leelanee Sterrett from the New York Philharmonic. Some returning faces will include Karl Pituch, Elizabeth Freimuth, and Denise Tryon. I have invited the Alloy Horn Quartet from the Chicago area to be our featured ensemble. We are fortunate to have the US Army Field Band in residence at the symposium for 2 days. We will end with a finale concert by the band. I am REALLY looking forward to coming back to IHS again for their Big 50 celebration. My very first IHS as a panelist-composer-jazz player, was held at Ball state in Muncie, for their SIXTH season, in 1974…44 years ago (!!!!) I remember meeting Frøydis, Barry Tuckwell, Fred Fox and other great players for the first time and having a memorable time surrounded by an army of killer horn players of all ages, who all shared a love for the instrument and for music and hadn’t succumbed to becoming ego-maniacal soured victims - but rather were friendly, enthusiastic and LOVED music!! I’ll never forget seeing huge rooms jammed with French horn cases and late night-early morning non-stop music and philosophy sessions with the people whose horns were getting some sleep in that sea of cases while we all sat up, after the last horn had been put to bed. I did a workshop called The Blues in F, invited everyone to bring their horns, and shared all that I had learned. Now 44 years later, I’m still doing it, and hoping I can pass on some BASIC ideas of how to harness the creativity that we are all born with, use the technique we acquire to execute the treasures of classical music, AND by improvising with others in ALL genres of music, to show that there IS life beyond Kopprasch!! The life of a freelancer in L.A. can be, at its worst, merely interesting, but at its best, absolutely magical. Every day is a different gig, with different players, in different cities within Southern California. The one thing we all have in common, however, is that we all spend tons of time on the freeway. What we all do in that time varies. Some like books on tape, some use the drive time to call friends and family we otherwise don't have time to call, or like me, some of us listen to podcasts. One day I was driving to a gig, listening to some nerdy podcast, and thought to myself, “I'm going to try and find a podcast dealing with horn.” From here, a troubling realization happened. The horn community, arguably the most nerdy, most communal, and most curious of all the instruments, didn’t have a dedicated podcast! This simply wouldn’t do. It was at this point, where I reached out to my good friend Scott Bacon, and the brainstorming began. Since Pathways started almost a year ago, we've heard many compelling stories starting with Bernhard Scully, and have since heard a dozen interviews with many more waiting to be released. Thanks to our wonderful listening audience, thousands of people have already gotten to come along for the journey as we dive into the road that leads some of the names we know and love to become the players we aspire to be. We have many exciting events planned for year two of Pathways, and one of those experiences is LIVE podcasting. At IHS 50, the IHS will host five (5) 50-minute sessions, celebrating fifty years of symposia with panel discussion on various subjects. Current and past Advisory Council members, Honorary members, and other horn luminaries will serve as presiders and panel members for retrospective looks at the role of these symposia in The Development of Horn Pedagogy, Sound/Tone, The Business of Horn-Making, The Music Workplace, and the IHS itself. Each session will begin with a brief lecture by the presider, and then a panel discussion including questions from audience members. Renowned pedagogue Douglas Hill will preside over the Pedagogy session, which will reflect on how pedagogy has evolved or even been influenced by past workshops. Frank Lloyd will preside over the session on Sound/Tone, which will explore how the concept of sound/tone of the horn has evolved over the past 50 years. Richard Bentson of Wichita Band Instruments will preside over the session on Horn-making; the panel for this session will feature horn makers and others who will consider the question: “How has the business of horn-making evolved over the past 50 years?” Nancy Jordan Fako will preside over the session on The Music Workplace, whose panel will reflect how issues of respect, equity, and gender issues have evolved in the music workplace over the past 50 years. 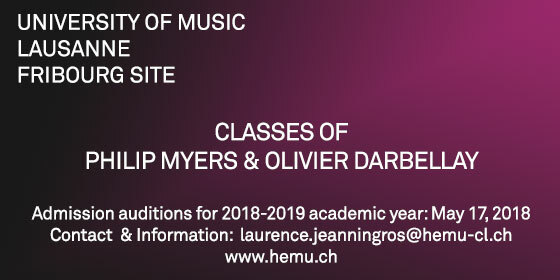 Finally, I will preside over a session on the IHS itself, and the panel will present various perspectives on how workshops have both reflected and influenced the growth and priorities of IHS programs, including new music for horn, scholarship programs and competitions, the presence of the society in the music world, and more. This celebration of 50 years of symposia and the parallel growth and development of our society should provide a lot of fun, memories, and provocative discussion. Please make time in your symposium activity schedule to attend these sessions! What else – oh yes, a light weight horn that is easy to hold, combined with some extra weight on the valves and on the mouthpiece to avoid cracking up in fortissimo, the new stick arrangement to hold the horn up while playing so my arms can stay relaxed all the time, combined with frequent visits to the health club to strengthen my arms, a little practice device that encourages less pressure on the upper lip, another one which will give me the “Super Power Embouchure,” and plenty of stuff for enhancing my breathing capacity and speed of air and thus the projection. My mother used to say – when confronted with the wishes for new clothes from her teenage daughter – youth decorates itself! Only now am I beginning to understand fully what she meant. The costs of fixing the hair, and of getting more coverup-and-take-the-attention-away-kind-of-clothes-and-accessories seem to be increasing with age, and for good reasons. As a brassplayer at this point of my life – I am a model 41 – I wonder why I still have the urge to perform – and therefore to practice? When I first started in the Oslo Philharmonic at the age of 20, my older colleagues were incredibly generous in moving down from their seats to let me progress rapidly from fourth horn (which was written in my contract, but I never played it, except in Beethoven‘s 9th) to third and soon on to the first and the hottest seat. I thought this had to do with their age (they were around 45) and that this was a logical development in every horn player’s life. After 40, not to mention 45, you must expect to play less good, and therefore please get out of the hot seats, the sooner the better. Make life easier on yourself, don’t practice on weekends, take it as it comes. Let the young people sweat! International Horn Society Contests and Scholarships! Over the years the IHS has run various programs that offer cash, performance and learning experience awards. The deadline for the contests and scholarships this year is April 1, 2018. Imagine having all your expenses paid to attend the 50th International Symposium in Muncie! How about the opportunity to perform at the Symposium? Cash awards? An orchestral coaching session for free? The key word is OPPORTUNITY! You can’t win if you don’t apply. 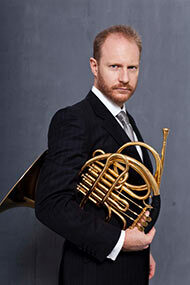 Many of our winners have gone on to illustrious careers involving the horn. One winner was asked about his experiences as a scholarship winner. 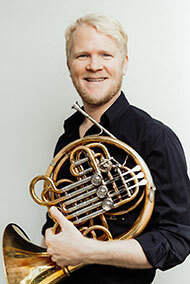 Gergely Sugar (GS) is a member of the ‘Wiener Symphoniker’, and a University Professor at the University for Music and Performing Arts Graz, Austria teaching both Double- and Vienna-Horn. Gergely won the Hawkins Scholarship Award in 1996, which covered his expenses to attend the International Symposium held in Eugene, Oregon that year. Being a student back then in Budapest at the Franz Liszt Academy, the scholarship was really everything. Without the financial help there was no way he could have been able to visit the workshop in Eugene. We asked Gergely: Was the Symposium for which you were awarded the Scholarship your first IHS Symposium? If so, what was the experience like for you? If not, how did it feel attending as an honored student, playing in a masterclass, or recital? GS: Yes, that was my first symposium and a long time dream of mine. It was just mind blowing. The whole world opened up at a blink of an eye. I loved every moment of it…. It felt like being shot to the stars. 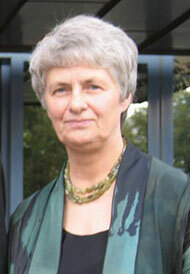 IHS: Has the Scholarship had a positive influence in your experience/education/career? If so, how? GS: The Scholarship had many influences on me, first and foremost, just to be able to be there and learn and listen and absorb. Then certainly the fact that my CV became suddenly serious. A winner is a winner, they took me at face value, it was easy to receive an invitation to auditions and, this one I only realized years later, some people even recognized me from the Newsletter at my audition in Vienna. IHS: Anything else you would like to add about your experience with the IHS Scholarship/Contest program? GS: If someone is willing to step into the headlight, international competitions, IHS contests and scholarships are one quick way to do it… It worked really well for me. To see more about the IHS Scholarship and Award programs please click here. Ich freue mich sehr, auf Einladung von Prof. Ab Koster einen pädagogischen Beitrag für den IHS Newsletter zu schreiben. Ich werde heute über die kammermusikalische Arbeit und die Wichtigkeit des gemeinsamen Musizierens innerhalb meines Unterrichtes sprechen. Ich habe erst kürzlich die Professur an der Musikhochschule Lübeck übernehmen dürfen und bin momentan dabei, eine neue Klasse aufzubauen. Hierfür ist es für mich von besonderer Wichtigkeit, eine gute Mischung aus noch sehr jungen, gerade im Bachelor anfangenden und schon etwas älteren Masterstudierenden, die auch schon erste Orchestererfahrung sammeln konnten, zu vereinen. Jeder kann so etwas vom anderen lernen, sich selbst weiterentwickeln und sich mitziehen lassen von denen, die schon weiter sind. Eine Klasse, in der jeder den anderen respektiert und bei der das Gefühl eines Zusammenhalts vorrangig ist. Das habe ich selbst in meinem Studium in Stuttgart so erlebt und möchte ich auch in meiner Klasse von Anfang an als oberstes Prinzip festhalten. Um dieses zu erreichen, habe ich gleich zu Beginn Hornquartette innerhalb der Klasse zusammengestellt, mit denen ich zusätzlich zum Einzelunterricht, der natürlich Hauptbestandteil des Studiums ist und immer sein sollte, auch im Ensemble arbeiten kann. Durch meine langjährige Kammermusikerfahrung in den verschiedensten Besetzungen, aber auch hauptsächlich in den letzten Jahren durch das Quartettspiel mit german hornsound weiß ich, wie wichtig das gemeinsame Musizieren, das Auf-einander-Hören und vor allem das allgemeine Kommunizieren (auch neben dem Spielen bei der Probenarbeit) ist. Vor allem die Kommunikation mit den KollegInnen und Studierenden braucht man später in jedem Beruf, ob man nun OrchesterhornistIn, KammermusikerIn oder PädagogIn wird. Deshalb achte ich auch innerhalb der Quartette darauf, verschiedene Alters- und Niveaustufen zu vereinen und zusammenzubringen. Wir arbeiten anhand der Quartettliteratur an der Intonation, der Balance, dem Zusammenspiel und an einer gemeinsamen Artikulation und Phrasierung, um so einen Quartettklang zu erzeugen, bei dem zwar jeder als individueller Hornist zu hören ist, bei dem aber trotzdem die Klangqualität und Homogenität als Ensemble im Vordergrund steht. Des Weiteren versuche ich auch, die Studierenden möglichst viel Kammermusik mit Streichern machen zu lassen, denn die Art, wie Streichinstrumente phrasieren, differenzieren und kommunizieren können, sollte auch für uns HornistInnen trotz der technischen Schwierigkeiten, die unser Instrument betreffen, das erstrebenswerte Ziel sein und wir müssen den Anspruch haben, dieses nachzuahmen.